For much of his political career, Peres was seen as a hawk; by the end of his life he was considered Israel’s foremost advocate of peace. Jerusalem — It was, perhaps, his last gift to us. Even in death, Shimon Peres inspired us. Though no longer among us, he managed to remind us that what we have built here is extraordinary — not only in our own minds, but in the minds of much of the Western world. Last Thursday, the day before his funeral, and on Friday, a few major highways and some of Jerusalem’s thoroughfares were closed to traffic. Some 8,000 police officers were deployed, seemingly everywhere, in what the press said was a security operation unprecedented in Israel’s very security-conscious history. We had to hunker down because, once again, Israel was at the center of the world’s attention. This time, though, we were the object not of opprobrium, but of honor. Some 90 delegations from 70 countries had come here. To be sure, they had come to honor Shimon Peres, and particularly his dogged pursuit of an elusive peace. Yet they had also traveled here to honor the country Shimon Peres had helped create, sustain and inspire. Glued to the TV like many Israelis, watching the funeral live, I had a sense of profound validation. The feeling would not last, I knew even then. 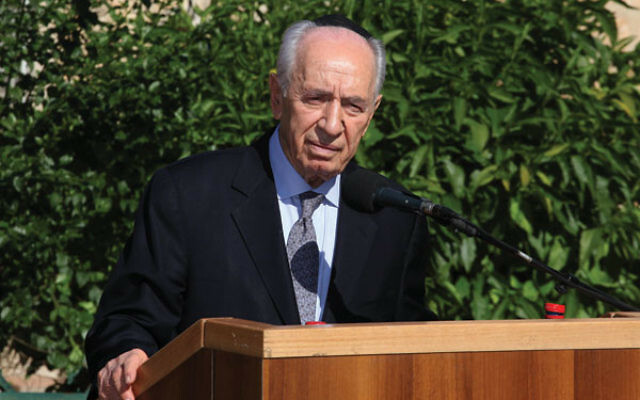 But for a few quiet hours on Friday morning, as the world gathered in our capital, it felt as though in his death, Shimon Peres had afforded us a moment to say to ourselves: “Never forget how extraordinary, even miraculous, is the country we built, the country in which you now live.” Over Shabbat, at our table and in shul, as I mentioned that feeling to friends, many acknowledged that they had felt the same way. I do not think we are naïve; yet even for a brief moment, that international recognition of what we have accomplished here felt better than many of us might ever have imagined it would. The sight of planes landing at Ben-Gurion Airport is hardly noteworthy. Yet the Israeli news covered — live — the landing of many of the planes that arrived for the funeral. It even replayed the recording of the control tower’s conversation with the pilot of Air Force One. It seemed almost childish, in a way, to be sure; but even Israeli television officials could not help themselves. For a day, Israelis from all walks of life celebrated the respite; for a moment we were not the reviled object of U.N. hypocrisy or the sole party responsible for a conflict European governments have decided they will no longer abide. For a moment, the world acknowledged what we know — this country is an extraordinary accomplishment, a project that has succeeded against all odds, perhaps the greatest story of a people’s rebirth in the history of all humanity. An American president saying before the entire world that he loves our little country!? Israelis recited that phrase, repeatedly, during the Shabbat that followed. Barack Obama, whose Cairo speech early in his first term has never been entirely forgotten — or forgiven — here in Israel, seemed intent on making amends. An American president often criticized for being unwilling to speak of American exceptionalism spoke unabashedly about Israeli exceptionalism. “Shimon believed that Israel’s exceptionalism was rooted not only in fidelity to the Jewish people, but to the moral and ethical vision, the precepts of his Jewish faith,” he said. Home? Israel? Goodness? Those of us watching the funeral together looked at each other in stunned silence. It will not last long; we know that. Yet it was a respite we needed, and which we relished. It happened thanks to Shimon Peres, our founder and our dreamer, our realist and our man of hope. His possibly final gift to us was that for one day, we had an opportunity to be reminded that one of the most hated countries on earth is still also among the most revered.